Submitted by Jason Horton on Apr. 3, 2019..
85 out of 100. Incorporating 2200+ ratings and reviews. 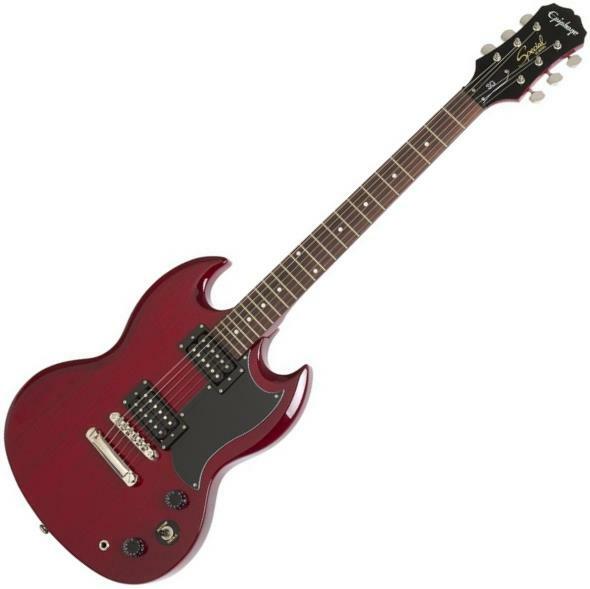 The SG (Solid Guitar) was originally meant to be a re-design of the Gibson Les Paul and Gibson gave it the same name. Les Paul wasn't involved in the redesign and asked that his name be removed and so Gibson obliged and renamed it the SG. The new design was meant to boost sales because the original was fading in the market, and it worked with more than 6,000 units sold during the first 3 years after the 1961 launch - more than 3 times the number of the original Les Paul Standards sold from 1958 to 1960. Gibson said in 2009 that the SG Standard was their highest selling guitar of all time. Legendary SG players include Angus Young from AC/DC and Tony Iommi from Black Sabbath. Students and expert alike describe this guitar as a fun instrument, and goes further by commenting that it has exceeded their expectations. From its fast action playability to the quality of the finish, the Epiphone SGSpecial continues to rake in compliments. Several people even said that it comes surprisingly close to the feel and sound of a Gibson SG. There were complaints about the quality and sound of the pickups - generally the same types of complaints found about most types of budget guitars. Some have gotten really good results by merely swapping out the pickups. If you're a fan or classic rock and metal, then this is the budget guitar for you if you can still find one for sale. If not, then check out our guide to The Best Electric Guitars Under $200.